The Missouri General Assembly passed HJR68 to put a 3/4 percent sales tax for transportation on the ballot in November 2014. MoDOT and its local planning partners– Metropolitan Planning Organizations such as Mid-America Regional Council in Kansas City and East-West Gateway Council of Governments in St. Louis, plus Regional Planning Councils throughout the state – will develop a list of projects to be funded by the tax before the measure goes to voters. Thus, a lot of local discussion (and deal-making) will be going on in the next couple of months. In the Kansas City region, this process coincides with (and somewhat complicates) MARC’s already-underway update of its long-range transportation plan, Transportation Outlook 2040. MARC will use its TO2040 workshop on May 22 to help decide project priorities for the whole region, as well as to narrow the list of projects that would be promised to Missouri voters. Setting aside for the moment the task of adding projects in the TO2040 update, it’s crucially important to give immediate attention to the Missouri sales tax project list. The 3/4 percent statewide sales tax is projected to yield $5.34 billion over the 10 years it would be in effect, and MoDOT has told MARC its share of the total will be $816 million. That $816 million will be spent on transportation projects within MARC’s planning area: Jackson, Clay, Platte, and Cass Counties. Even more important is that the money isn’t restricted to highway projects. Transit, bike, and pedestrian projects are eligible, as are passenger and freight rail, airport, and river port projects. In fact, it is possible in theory that the entire $816 million could be spent without rebuilding or expanding a single highway. Possible, but not likely. For example, MoDOT wants to rebuild I-70 across the state, and they might like to see the cost of the Kansas City region’s segment of I-70 come out of our $816 million. In addition, MoDOT (to say nothing of the Missouri Public Transit Association) would like to see stable funding for rural and urban transit. Same goes for passenger rail service, the Missouri River Runner trains operated under contract by Amtrak. At present, MoDOT has to go hat-in-hand to the legislature each year for the $10 million or so it costs to keep the trains running. 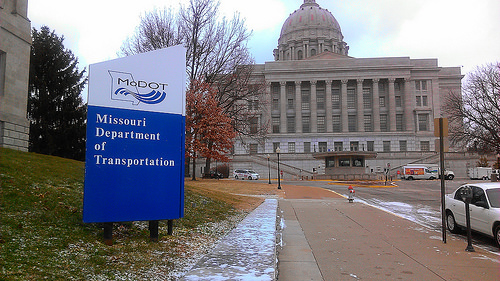 MoDOT might want our region’s share of that total to also come out of the $816 million. The important thing for May 22 is that advocates for a balanced transportation investment program need to be there to express the strongest possible support for transit, pedestrian and bike projects — projects to make streets and roads safer for people not driving cars — as well as for stable funding for continuing (and increasing) passenger rail. This entry was posted on May 19, 2014 at 11:30 AM	and is filed under Action, Events, Local Transit Issues, Regional Transit Issue. Tagged: MARC, MoDot. You can follow any responses to this entry through the RSS 2.0 feed. You can leave a response, or trackback from your own site.